"Blending nostalgia for the past with curiosity for the present" is the essential design philosophy of Studio Peregalli's work. By infusing their work with deep historical research and an unprecedented level of craft, the designers are able to imbue each project with a unique sense of history and ambience. 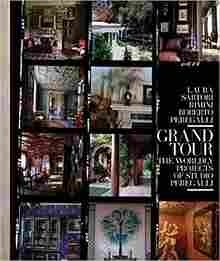 Grand Tour is a movable visual feast with remarkable photography of grand rooms contrasted with beautiful details and exquisite craftsmanship. Each house presented here is the fullest expression of the Studio Peregalli's design-compelling, spectacular, and unique. If Invention of the Past can be considered to be a taxonomy book of Studio Peregalli's design thinking, Grand Tour is a true monograph: project after gorgeous project from around the world: from Milan to Paris and London to exotic Tangier, St. Moritz, Tel Aviv, and New York. A must collect for all lovers of grand and exquisite architecture and interior design.